Of course it can't be found now, but earlier this week I somehow stumbled across a blog detailing a couple's weight loss journey after adopting a plant-based diet. Not to be disrespectful, because that's AWESOME and they were apparently very succcesful with it, but that's not the part that caught my interest. Nope. Instead, it was how they got started that did. Namely, and this really can't be fully recommended across the board, but...they ate nothing but plain potatoes for two weeks to kick things off. From what I surmise, it was like to reset their tastebuds, a little sensory deprivation so they'd more easily adapt to finding enjoyable flavor in their new diet...but still. Props to them, and it's only weird if it doesn't work. One small step up from that would be plantains, I'd think. Similar plainness and starchiness. A little sweeter, sure, but not as much sugar as even like a banana. Plantains are plenty tasty, but they could at least occasionally use a little livening up, too. So, hey...here's the new Trader Joe's Jerk-Style Plantain Chips! 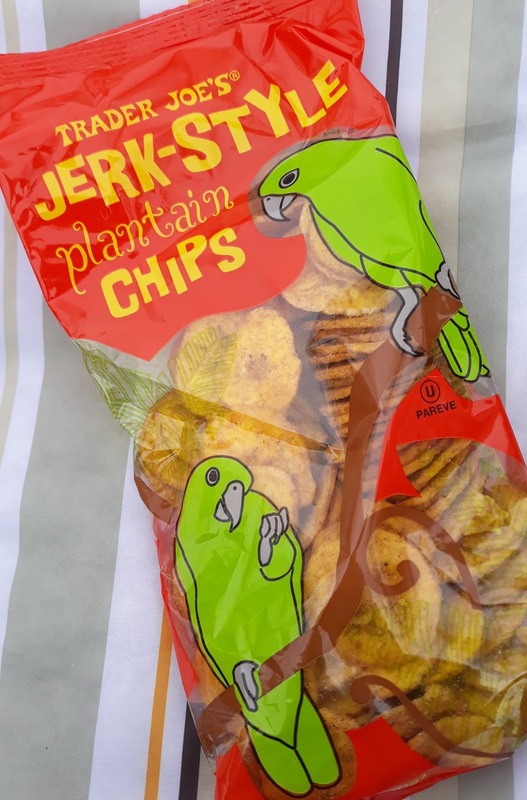 If you're not familiar with plantain chips, they're still a little crispy and crunchy, but there's also kinda soft-ish Styrofoamy kinda feel to them, too. They're sorta an odd mix between potato chip, banana chip, and disposable coffee cup. I personally love that kinda texture, but it can be offputting to some. That's what we got going on here, but the chips are coated all over with jerk seasoning. And it's potent. Hooo-hoo. My four year old took one lick of one chip and immediately reenacted Buddy the Elf and passion fruit spray. Not for her, for sure...but man, it's for me. Plenty of heat, plenty of spice. But there's also a certain "warmness" that plays into the natural flavors of plantains. I think that derives from the allspice and cinnamon. So it may not be a true "jerk" seasoning blend (hence the "jerk-style", I suppose), but there's still the garlic and pepper and chili and everything else, so it works and therefore is not weird. Delicious chips. 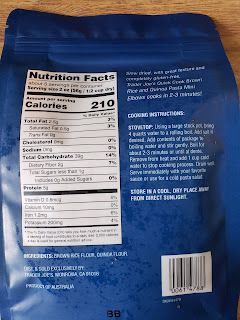 A bag sets you back only $1.79, and I kinda can't believe that it's not a single serving, because I could devour the whole thing. Could. Shouldn't. I won't say that I won't ever. Excellent chips in my opinion. Are they healthier than potato chips? Who knows? But I like them as a variation at the very least. Check 'em out for sure! Double fours. So much symbolism with the apple. "Eve ate the apple," even though it wasn't really an apple. "As American as apple pie." Newton's apple helped discover gravity. The Mac computer symbol is an apple with a bite out of it. "The apple doesn't fall far from the tree," as they say. So what do I have to say about this appley product? Applicious? No, unfortunately. App-palling? Nah, I wouldn't quite go that far. We both found this stuff disappointing. Our loaf was very dry on this inside, and Sonia and I both came up with the adjective "oily" to describe the outer portions. Not moist. Oily. There's a decided lack of apple pieces. Apple chunks? No way. Not one. Not even a ton of apple flavor. 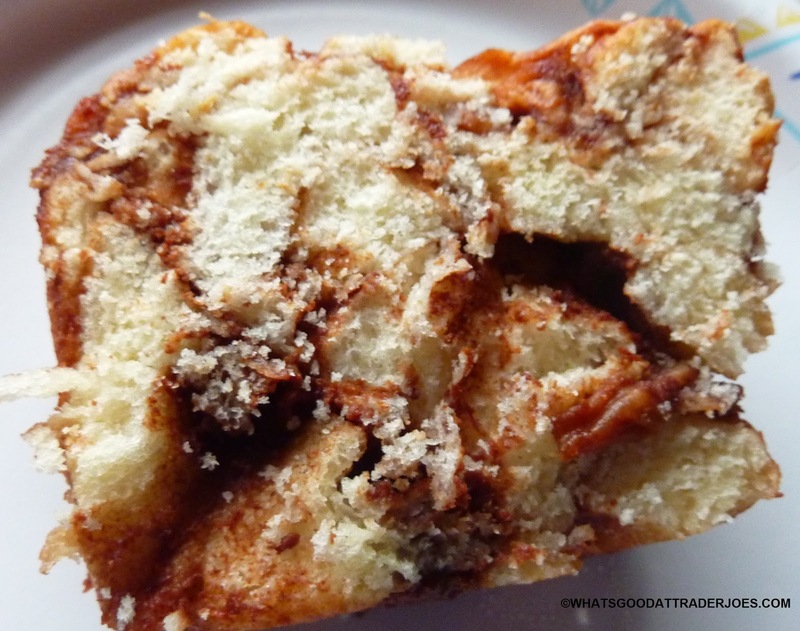 Cinnamon, yes. If anything, there's way too much cinnamon. That's the primary flavor. And we both like cinnamon. There's just something about our loaf that makes us want to cough. It's not that we can feel the cinnamon granules. 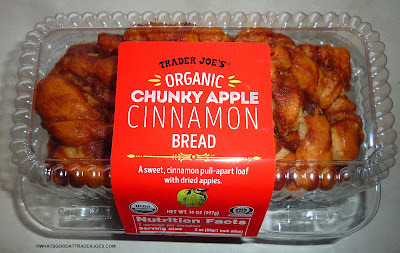 It's just an odd, dry, cinnamon vibe that's devoid of the juiciness of apples or the softness of a traditional loaf of cinnamon bread. The norm is that we find a product at Walmart that can compare to something at TJ's, and the latter almost always outshines the former. Price, quality, organicness. You name it—the Joe's version is better in almost every way. It's generally laughable to even compare the two. 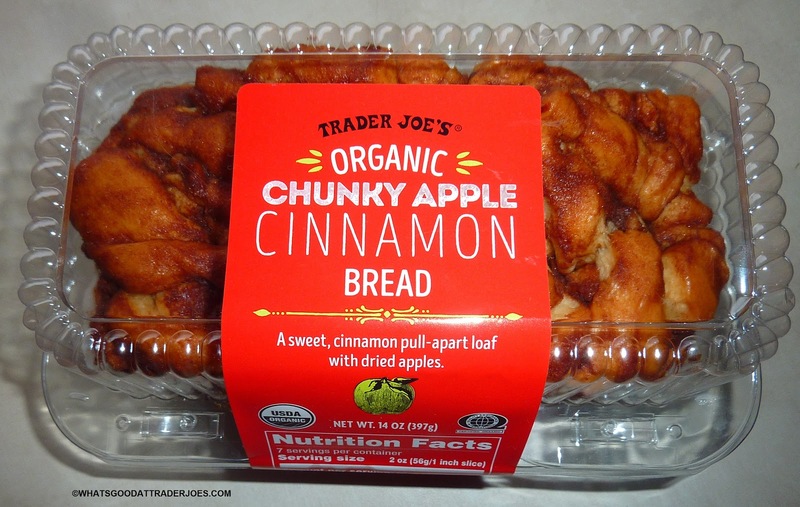 However, in this instance, Sonia recently discovered some apple cinnamon bread there that blows this loaf out of the water. Unfortunate for this product. No, the Wally World bread isn't organic, nor is it "good for you" in any way. But it tastes the way we wanted this stuff to taste. 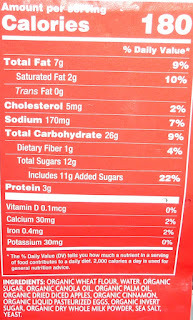 Just FYI, the top part of the nutrition information got lost in the glare. 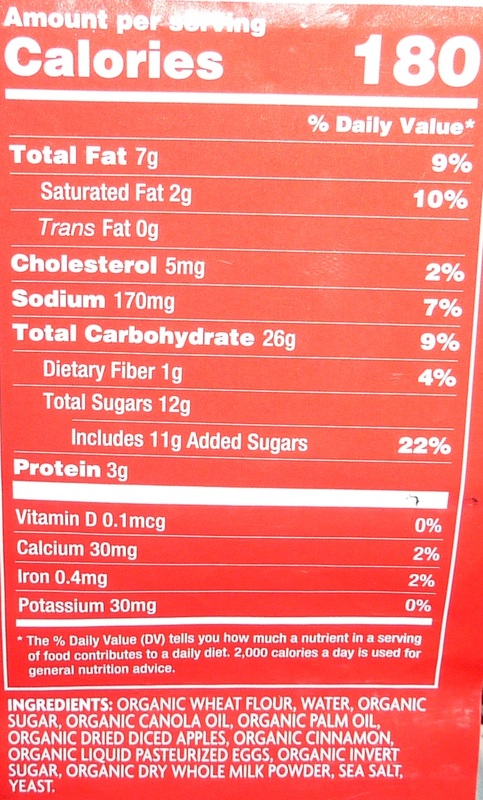 It states that there are seven servings per container, each one two ounces. Two and a half stars from this guy. Only two from the missus. Bottom line: 4.5 out of 10. This has probably been shared before, but seared into my memory from growing up is one of the worst things ever done to my mom's perfectly delicious homemade macaroni and cheese: canned tuna fish. Maybe you like that stuff, and that's fine, but for me it makes me gag as I can think of is my old cat barfing it back up after begging for some. All of us kids hated it, too, so if we were all acting up my mom would make tuna fish casserole as a "punishment meal." Such was the case one day, but somehow I was pretty innocent in the whole matter, so when my mom said she was making tuna fish casserole for everyone, I probably broke down in tears and asked if she'd take mercy and at least make it more like her mac 'n cheese, but just add the tuna. She took mercy and my suggestion...and it wasn't bad compared to punishment casserole but against her heavenly mac? Mortal sin. Awful. And then for like the next time ten times she mac 'n cheese, she put in tuna fish, crimes committed to earn that or not. I still haven't completely forgiven her. Point is, there's far worse things you can do for homemade mac 'n cheese than to use Trader Joe's Brown Rice & Quinoa Pasta. But seriously: not intended for mac use. Would be better thrown out the windows for that. 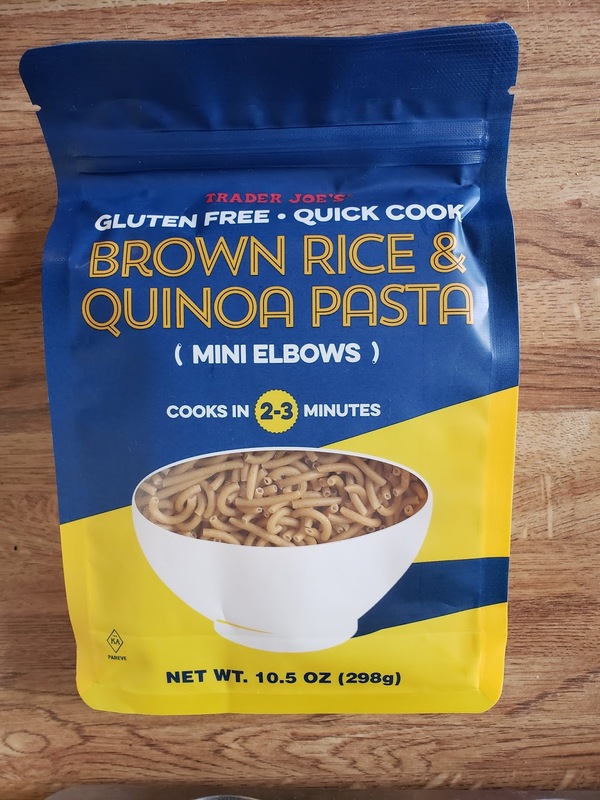 It's not that this gluten free quinoa/rice min elbow pasta tube experiment tastes bad. No, not at all. Perfectly fine and I'd say at least when swimming in cheese and a little garlic salt, it tastes the same as the regular semolina fare. It's just mushy. So, so mushy. In its defense, we might have slightly overcooked the noodles, and by that I mean more towards the three minutes and not two the package gives for its boil time. Seriously, even picking a noodle up (like pinching one out of the pot) caused the whole thing to practically disintegrate. I'm thinking the reason why they're mini is that anything bigger would stand no fighting chance of being structurally sound. Still, in about thirty seconds, the pasta went from appropriately firm, slightly denser than al dente noodle to little micro mush tubes. There's not much forgiveness there. I'm guessing that mac n cheese was the wrong choice to try out the pasta. With regular sauce, or perhaps a cold pasta salad, or in some other less demanding dish these noodles might have been just fine. Or if mushy mac is tolerable for you and you need a gluten free option, by all means, go right for it. In all, I really have no quarrel with this product. 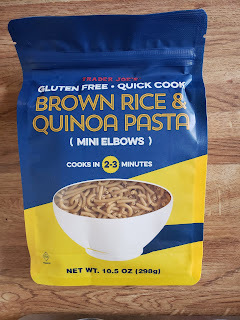 Quick cook convenient gluten free options are always welcome. Just keep a close eye on it and consider its application carefully. If we had done so, maybe I'd tune a different song. Couple bucks for the package, and three spoons each.